Child Care Aware of Virginia Brain Development Begins Before Birth! Brain Development Begins Before Birth! The brain grows sequentially, from the bottom to the top. The brainstem is first, controlling important physical functions including breathing, heart rate, and body temperature. Next, the cerebellum is formed. It is located behind the brainstem and controls one’s balance and coordination. 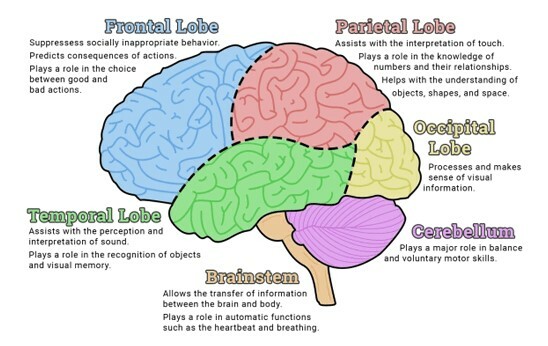 Following this is the temporal lobe, the emotional center of the brain. And lastly, the cortex is formed. The cortex is the area that handles all of the executive functions of the brain; like language, decision making, memory, and behavior. Did you know that brain development begins before birth–within just one week of conception? During this prenatal period, brain cells are already busy sending and receiving sensory messages of touch, sound, and movement. The senses of taste, smell, and sensitivity to light are also beginning to develop. The brain is formed mainly from genetic code that comes from both mom and dad. These genes are responsible for the basic wiring of the brain — for forming all of the neurons and establishing the general connections between the different brain regions. When you hear about “nature vs. nurture,” this is the “nature” part of brain development. Just as genetics play a role in forming the brain, a child’s environment is equally important. Environment, or the people, physical spaces, and stimuli that shape a child’s experiences, is responsible for fine-tuning those synapse connections, helping each child adapt to his or her particular environment. One example of this is how children develop their preference for language. Our brains are preprogrammed to recognize human speech and to distinguish between individual speech sounds, allowing us to put together words and their meanings, and to understand the rules for ordering words in sentences. However, the language and accent a child learns depends on environmental factors present during the early years of development. At birth, about 100 billion neurons, or brain cells, have been produced. Not only are most of the brain cells formed, but they have spent time traveling to the appropriate sections of the brain and are beginning to connect to one another. Although most of a newborn’s brain cells are formed during the prenatal period, the brain is nowhere near finished developing at birth. Additional connections are formed after a baby’s birth, and existing connections are strengthened even until your 20’s. We should think of brain development as an active, lifelong process. 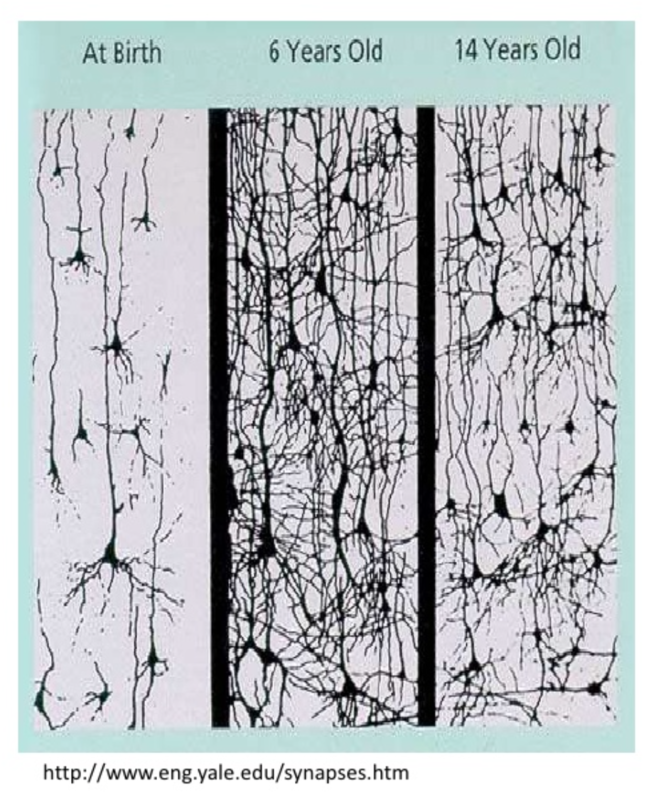 By age three, 83% of all of the synaptic connections have been made. Just three years later, a child’s brain has twice as many neuron synapses as he will have as an adult, and during the first 10 years of life, the brain is twice as active as it will be as an adult! The synapse growth then levels off, and pruning begins. The picture to the left shows an example of these neuron synapses in a child’s brain at birth, 6 years old, and 14 years old. Pruning refers to the loss of unnecessary connections in the brain, which is normal and healthy because it helps strengthen remaining connections. When it comes to our brains, if you aren’t using it, you’ll lose it. When you hear “nature vs. nurture,” this is the “nurture” part of brain development. Annie Murphy Paul (author of Origins: How the Nine Months before Birth Shape the Rest of Our Lives) shares a powerful TED talk on what babies learn before they’re born.